Happy Fall, y’all! With fall comes brisker weather — which as someone who is always warm, I quite enjoy — along with delicious foods. Pumpkin, anyone? 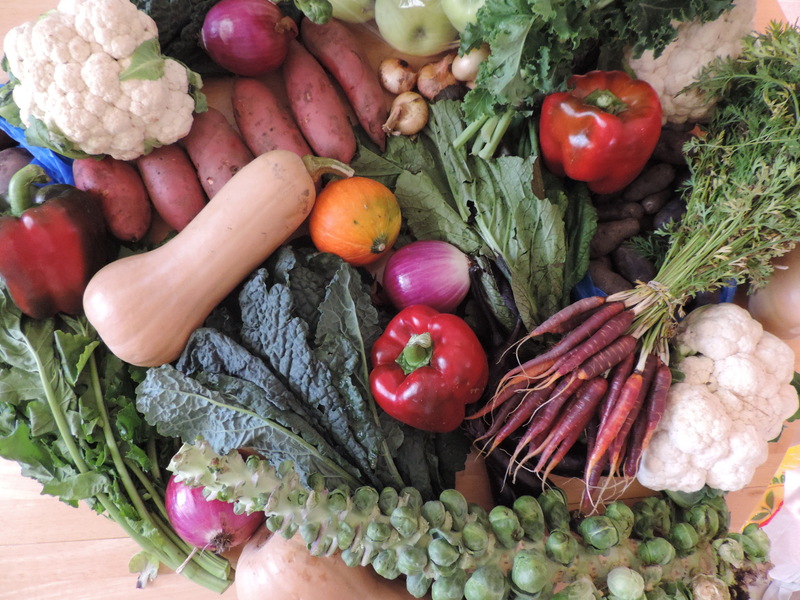 See also: Brussels sprouts, squash in all shapes and sizes, cauliflower, sweet potatoes, etc. Many of the awesome ladies at the event were asking for recipes, so I figured I would do a series of posts. I want to first highlight my personal favorite dish of the night (and one of the easiest to make! ): a roasted butternut squash and kale salad. I’m all about color and texture in my recipes, and this one really offers it all. 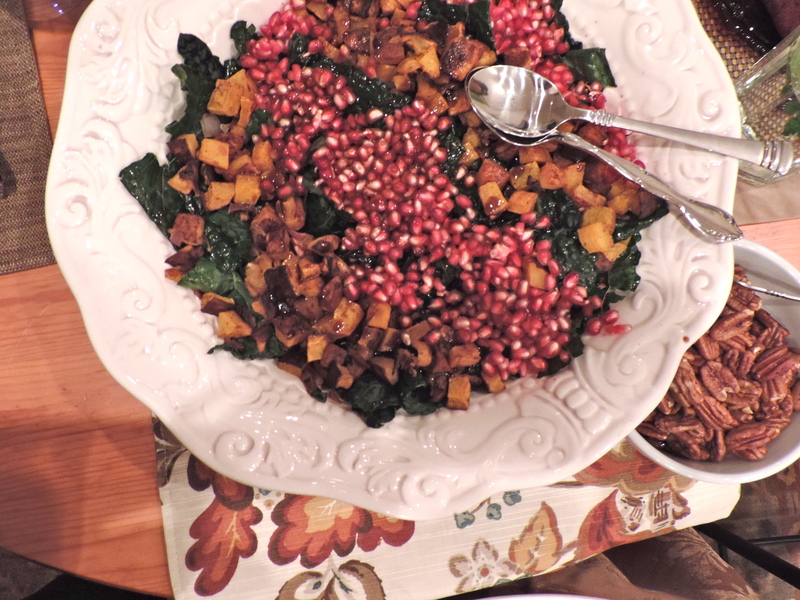 Crispy kale, the “pop” of pomegranate, the smooth, creamy texture of roasted butternut squash plus candied pecans on the side to add sweetness and crunch. Drizzle it with a super-simple Mission fig balsamic vinaigrette and you’ve got a major crowd favorite. This salad is vegan but to add a little more protein, try topping with grilled chicken, salmon or to keep it vegan/vegetarian and up the protein, add some lentils or chick peas to the mix. Cut the ends off of the butternut squash then cut in quarters. Scoop out the seeds. Using a sharp knife, cut the peel off, then dice into 1/2″ cubes. Toss diced butternut squash and red onion with coconut oil, cinnamon and sea salt. Spread on a baking sheet and roast for 25-30 minutes, or until desired level of char (I like mine really charred). While squash and onions are roasting, add kale to a large bowl and drizzle with 2 Tbsp. olive oil. Using hands, massage oil into the kale. This will take out some of the bitterness and make the kale a better texture. Put the massaged kale in the fridge to marinate while you prep everything else. To remove the seeds from the pomegranate, roll the pomegranate gently around on the table (before cutting into it). You will hear and feel the seeds loosening. Then, cut the pomegranate in quarters and scoop out the seeds. Keep seeds refrigerated. Add 2 tsp. coconut oil to a pan and heat for 1 minute, then add pecans, 1 Tbsp. maple syrup and 1/2 tsp cinnamon to pan and toast, stirring frequently, for about 5-7 minutes. Using a whisk, mix vinegar, 3 Tbsp. olive oil and 1 tsp. maple syrup. On top of “massaged” kale, add pomegranate seeds, roasted butternut squash/onions and candied pecans. Drizzle with dressing. Stay tuned for more fall recipes coming your way. And while I’m not generally a “vegan” cook, these recipes have mass appeal and include REAL foods that anyone can get behind. Hope you enjoy! By posting this recipe I am entering a recipe contest sponsored by the California Raisin Marketing Board and am eligible to win prizes associated with the contest. I was not compensated for my time. The holidays are certainly upon us. I’m not sure about you all, but we have holiday parties/festivities for the next several weekends (not that I’m complaining). That means lots of food, and most of it not very healthful. My general plan of attack for myself (and what I recommend to clients) is to bring a couple dishes that you have prepared and feel good about eating. That way, when you’re surrounded by marshmallow and sugar-laden sweet potato casseroles, creamy vegetable sides and indulgent desserts galore, you at least can at least eat/feel good about eating the dishes you brought (and maybe skip some of those disgusting creamy casseroles). For the holidays, my go-to dish is a salad. It’s the dish I volunteer to make for all my holiday parties, partially because I don’t trust others to make a good salad — I’m a control freak and I’ve never denied that — and partially because I make a damn good salad. So when the folks at California Raisins tasked us with creating recipes that are “naturally sweet for the holidays,” my mind went to salad. When making a salad, I love taking seasonal vegetables and adding just a touch of sweetness, whether that’s a honey-infused vinaigrette, raisins, or both, as I’ve done here. California Raisins add natural sweetness with zero fat, no cholesterol and no added sugar. Plus, they offer 9% your daily fiber and potassium, and 6% of your daily iron. They’re a great choice for wholesome at-home or on-the-go snacking, plus they lend themselves well to both savory and sweet applications, where they provide natural sweetness. They are seriously amazing for snacking, though, as evidenced by the fact that my roommate and I snacked on a pretty portion of the bag of California Raisins before I even started to create my recipes, to the point where I had to go back to the store to get several more bags. No biggie though, because California Raisins are the most economical dried fruit, according to the USDA. 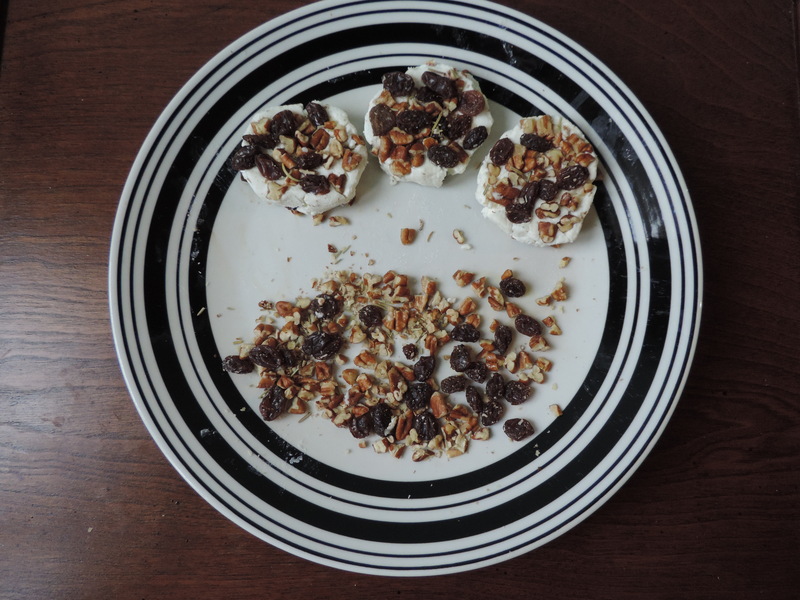 As a sidenote, I love to pop a few raisins with peanut or almond butter — ants-on-a-log sans the celery, if you will — and also add them to my plain Greek yogurt to add extra nutrition and a little natural sweetness. They also were d.e.l.i.c.i.o.u.s. in my Vegan Moroccan Stew, which I made for another ReDux a few months ago. 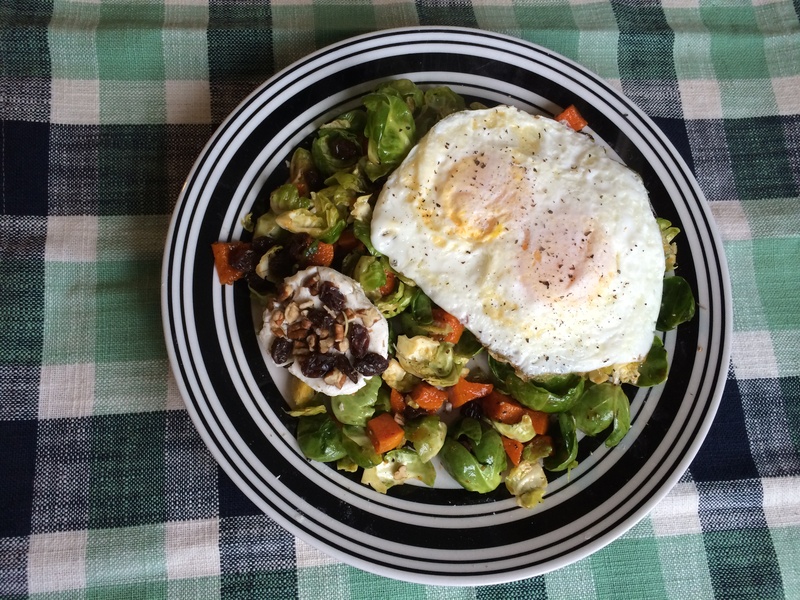 This salad is perfect for the holidays and because the Brussels sprouts don’t wilt like other greens, you can actually prep and dress the salad up to 1-2 days ahead of time. California Raisins add a great sweet note to the salad and the goat cheese brings just the right amount of tang. Peel butternut squash using a sharp knife then cut in half, lengthwise, and remove the seeds from the middle. Dice into small (~1/4″) cubes. Toss with 1 Tbsp. olive oil and lay on a baking sheet. Roast at 375 degrees for 30-45 minutes, or until the squash is soft. While the squash is cooking, cut/shred Brussels sprouts, then wash and thoroughly dry them (or use a salad spinner). 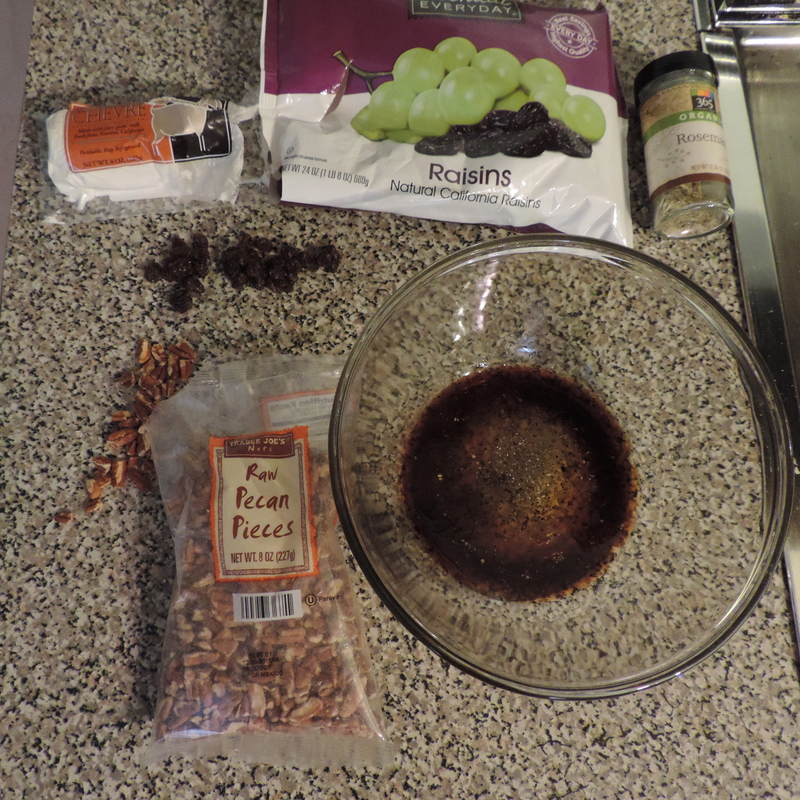 Mix 1/4 cup California Raisins, pecans and rosemary and gently press mixture into both sides of the goat cheese slices. In a large bowl, add balsamic vinegar, 2 Tbsp. olive oil, honey, pepper and salt. Use a whisk to mix. 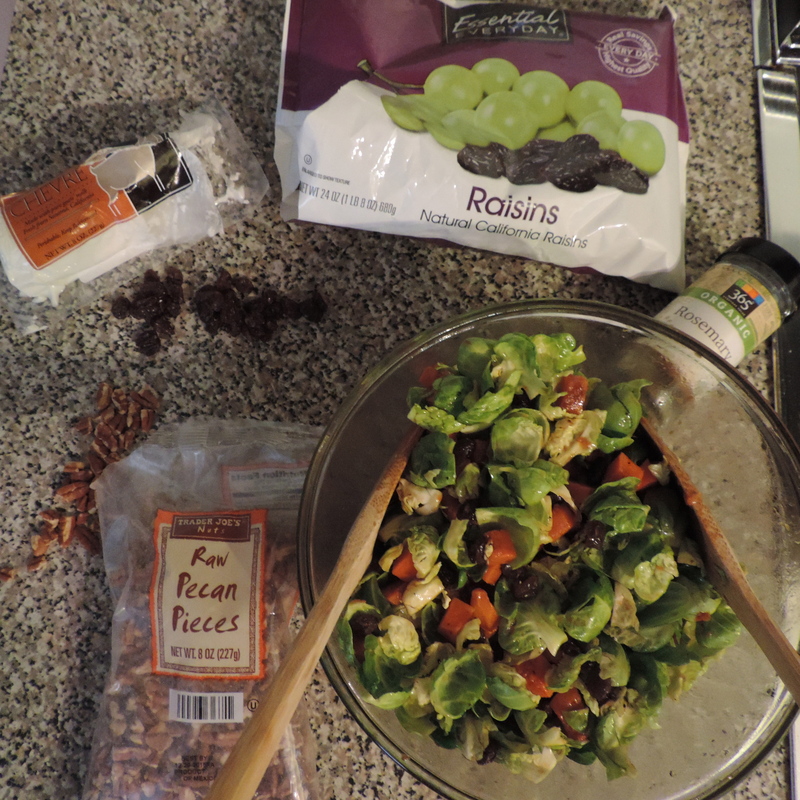 Add shredded Brussels sprouts, roasted butternut squash, and remaining 1/2 cup California Raisins and toss with dressing. Top with pecan and California Raisin-crusted goat cheese. To make it a meal, try adding grilled chicken, turkey or fried eggs, as I did for breakfast yesterday. 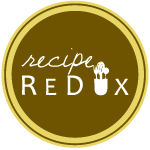 See how other Recipe ReDuxers are using California Raisins by clicking the link below. Ever since eating my first Niçoise salad, I’ve been hooked. The perfect green beans. The Kalamata olives (my favorite). The potatoes, which give just the right amount of sustenance to the salad. And of course, the seafood. Throw in hard-boiled eggs and a delicious dressing, and you’ve made the classic. Well, last week, the urge for a Niçoise salad hit and it hit bad. Since I didn’t have all of the ingredients on hand for the classic, I decided to mix it up a bit and do my own take. 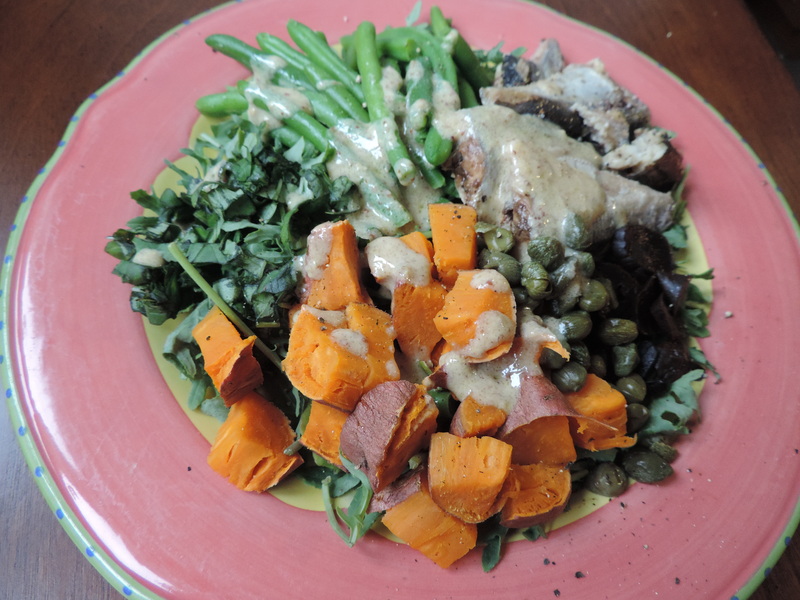 Leftover sweet potato subbed for white potatoes, kale subbed for lettuce, capers subbed for olives and sardines subbed for tuna/anchovies. Plus some fresh basil from my beloved Farmed Here and black garlic — a new obsession — to add a little more flavor. Top it off with a 3-ingredient Dijon vinaigrette and I was in Niçoise heaven (or at least my improvised version of it). Oh and no offense to the Niçoise peeps, but I feel my version is quite possibly tastier and most definitely packed with more nutrients than the original — from the “superfood” status of kale to the omega-3 content (it’s high, folks) of sardines to the antioxidant power of fresh herbs. 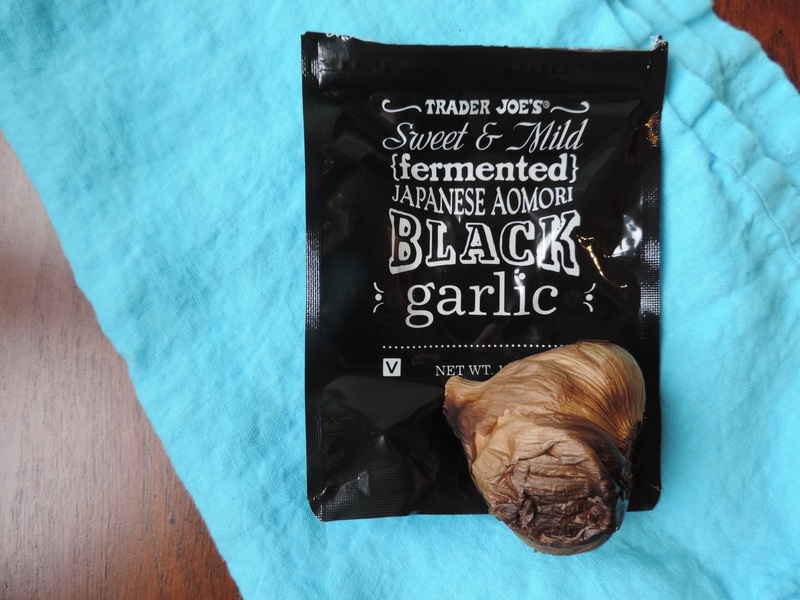 Trader Joe’s just started carrying fermented black garlic, which is where I bought it. If you live near an Asian market, however, you will most certainly find it there. Fresh rosemary or thyme would also be delicious in place of the basil. Poke holes in sweet potato and microwave for 3-5 minutes, until potato is soft. You can also use a leftover baked sweet potato if you have one on hand. Cut the sweet potato into large wedges. Assemble salad: Lay kale on top of a large plate. 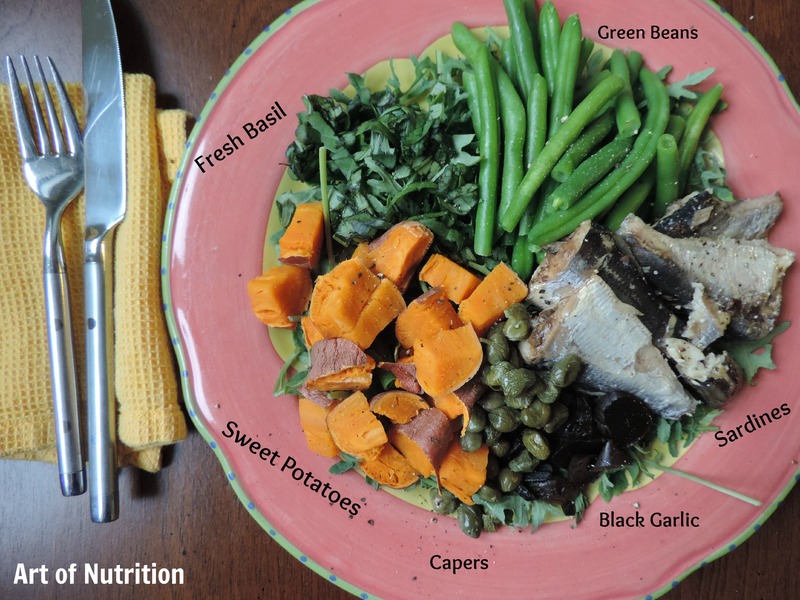 Top kale with cut sweet potato, can sardines (drained), cooked green beans, capers, sliced black garlic and fresh basil. Grind black pepper over the salad. 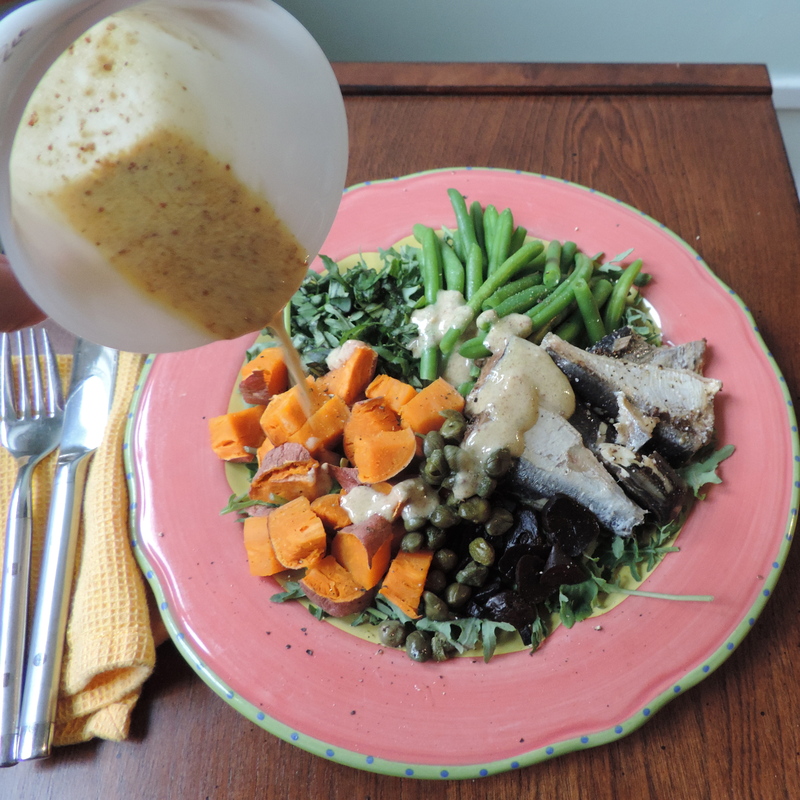 Make dressing: Mix Dijon mustard, olive oil and apple cider vinegar in a small bowl. Pour over salad. Happy 2014, everyone! Did anyone drink several one too many cocktails last night? If you’re like me, you are bumming around today, downing water and watching the Food Network whilst surfing Pinterest for yummy recipes. I call this hungry over. And while we all want to reach for greasy, cheesy, high-calorie foods, I promise you, it will only make you feel worse. Instead, make sure you HYDRATE, not just with water, but also with fruits and vegetables, which are mostly water — along with vitamins and minerals, which will surely also help you feel better. 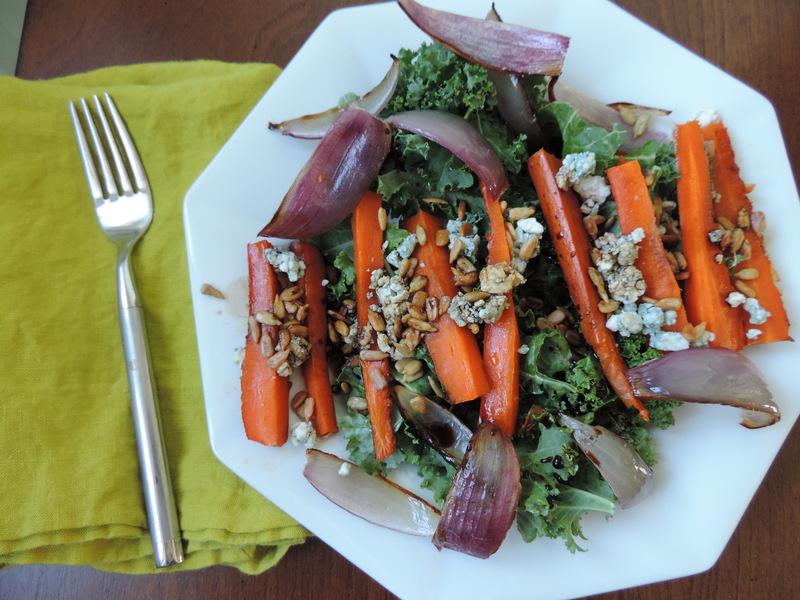 This recipe for kale and roasted vegetable salad is delicious, will help your hangover and also get 2014 started the healthy way, because we all want to eat better this year, right? The flavored balsamic vinegar in this recipe isn’t crucial, but it’s definitely delicious. I am lucky enough to have an olive oil and vinegar shop called Oh, Olive in my neighborhood, which has the most amazing infused oils and vinegars. Aged balsamic would also work nicely. Preheat oven to 375 degrees. Place whole carrots and red onion wedges on a large baking sheet. Drizzle with olive oil. Roast for 30-40 minutes, or until carrots are soft. Sprinkle with salt and pepper. Cut carrots into match sticks (like those pictured). Place 2 cups kale on two plates. 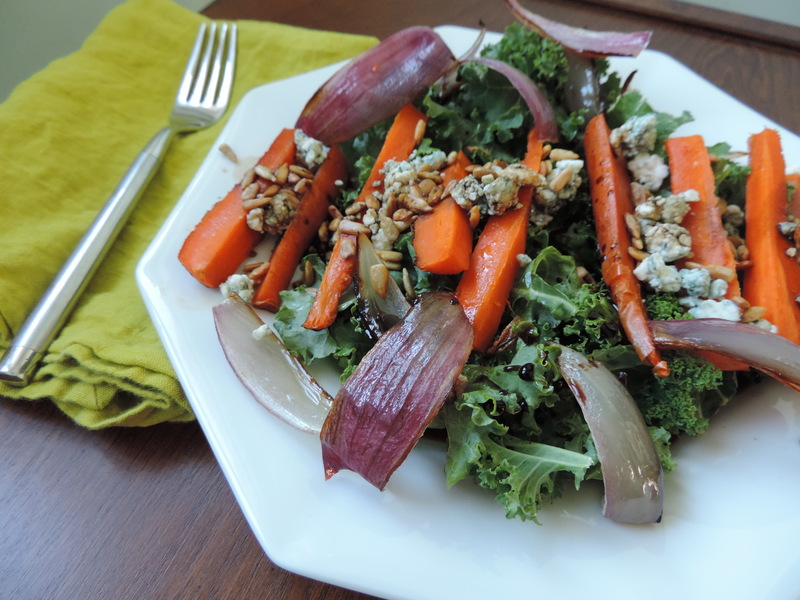 Top with carrots and red onions, sprinkle with blue cheese and sunflower seeds and drizzle with balsamic. Here’s to a happy and healthy New Year! Cheers!